convert Windows Media into a format that will be compatible with your computer. Are you running macOS High Sierra 10.13 or later? Check out Switch! Flip4Mac currently supports only Mac OS X 10.6.8 thru 10.11.6. If you are running macOS High Sierra 10.13 or later, use Switch to play back and convert Windows Media into a format that will be compatible with your computer. Check out Switch for more details. Play Windows Media files (.wma and .wmv) directly in QuickTime applications and view Windows Media content on the Internet using a web browser. Adds the ability to import WMV and WMA files for editing and conversion to QuickTime formats or iOS devices. Includes all the features of Player Pro, and adds the ability to create standard definition (up to 768 X 576) WMV files using preset templates and custom WMV encoding profiles. Includes all the features of Studio, and adds two-pass HD (up to 1920 X 1080), VBR encoding and pro audio features. Play back Windows Media Files and convert them to MP4 files compatible with all of your devices. Support for current and future versions of macOS. Play back your Windows Media content and convert the content into any output format that Switch supports. Switch Plus and Pro can play back all commonly used media formats and adds the ability to convert media into Windows Media files. If you are running macOS Sierra 10.13 or later, use Switch to play back and convert your media into a format that will be compatible with your computer. Check out Switch for more details. Upgrade from within your software and save! If you own a Flip4Mac license and want to add features, use these upgrade paths to receive credit for your previous purchase. Open System Preferences, click the Flip4Mac icon and select the Upgrade tab. Click the lock icon, enter an administrator name and password to make changes to the upgrade settings. 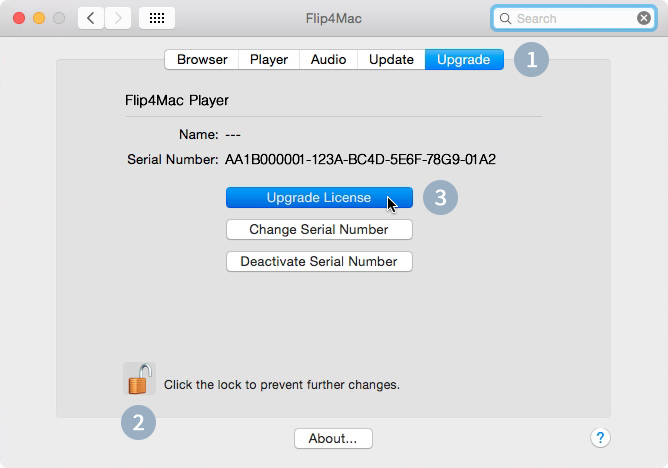 Click Upgrade License to start the secure Flip4Mac Software Purchase Wizard. When the purchase is complete your serial number is automatically entered and activated. You will receive an order confirmation via email containing your serial number. Save this receipt in case you need to re-install the software or re-enter the serial number. Please read the Telestream Software License Terms and Conditions carefully before installing this software.